WOW! I have never seen a squirrel wag it’s tail… Funny! Actually, they shake their tails when they’re upset, when they feel threatened. Have you ever heard them snigger? 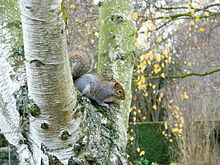 There seems to be a definite lack of squirrels in your area – now I know what to do with one if I catch it!